Although the North Carolina section of the New River in Ashe and Alleghany counties is known for its tranquility, in West Virginia, the waterway is one of the premiere Class V white-water destinations in the country. The wildest stretch of the river packs 27 rapids (with imposing names like Greyhound Bus Stopper) into an eight-mile run. Hard-core boaters choose sleek white-water kayaks as their weapon of choice; the rest of us are relegated to big rubber boats guided by people like Steve. Today, we’re paddling a milder section of the Upper New in individual rafts called duckies, which are like blow-up kayaks. We have four miles of Class II and Class III white water to go when Steve shares the River of Death nugget. No turning back now. Not that I would if I could. The Upper New may not offer the big, billowy rapids of the Lower New, but it has beauty in spades. Part of a 70,000-acre National Recreation Area run by the Park Service, it’s the longest, deepest canyon in the Appalachians, with walls stretching 1,400 feet high. The lush banks of the Upper New rise straight up from the water’s edge, forming a steep V of green. Soon after putting in, we see a bald eagle, its white tail and head flickering against the dark gorge walls. Steve lives in a 10- by 12-foot shack—one of those garages you buy at Lowes with no water, no plumbing, and no power except for a solar panel big enough to charge his cell phone. 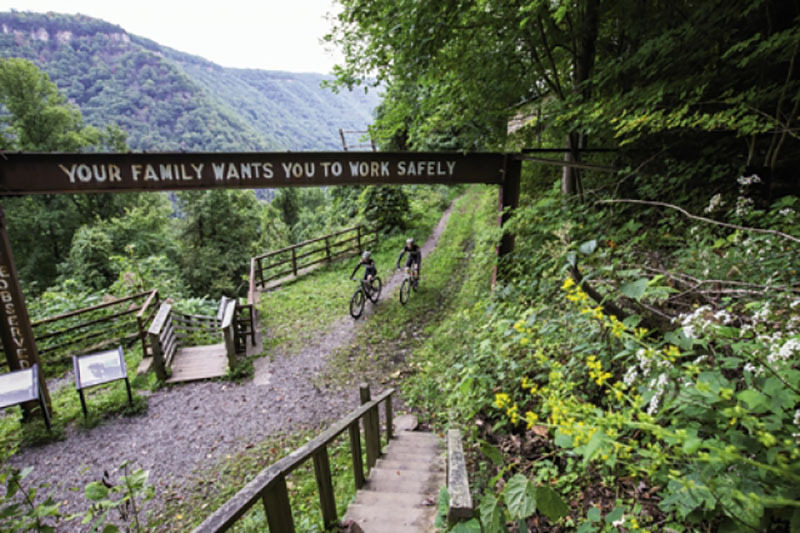 In Fayetteville, West Virginia, the former mining town that sits on the edge of the New River Gorge, this is known as living the dream. Located about three hours north of Boone, Fayetteville is full of people who wear Chacos to work and sit in the sun drinking beer at 2 p.m. on a Tuesday. It’s hard to imagine what the town was like during the coal boom of the early 1900s. The coal seams surrounding the New River were some of the purest in the country, spawning the construction of more than 60 tiny coal company towns, including Red Ash, which had a baseball team that, according to local legend, beat the Cincinnati Reds in an exhibition game. Most of those outposts are forgotten, their bones buried deep in the woods above the river. The mines began shutting down in the ’30s after the coal seams were exhausted, and the National Park Service bought the land, establishing the National Recreation Area in 1978. Now, instead of coal miners, mostly boaters and rock climbers populate the area. Fayetteville isn’t much bigger than a square block with a big, brick Romanesque revival-style courthouse looming in the center. It’s just big enough to support the necessities—a killer sandwich shop, a couple of bike stores, an outfitter with tons of wicking layers, a good pizza place, and a brewery on the outskirts of town. There’s no practical reason for Fayetteville to be thriving in 2015. The coal is gone; the timber companies are gone. The only business left is adventure, but that business is booming. In addition to the New River, the town is also the launching point for paddling the Gauley, which offers even bigger white-water hits. Summersville Lake, at the head of the Gauley, has turned into a stand-up paddle boarding hot spot. And the climbing is arguably better than the paddling. Drive across the gorge and glance into the chasm, and you might think there’s no rock in that canyon, but beneath a veil of greenery are nearly 60 miles of steep sandstone cliffs, some of which are 150 feet tall. Put it all together, and you have more than 3,000 established routes, making it one of the largest climbing areas in the East. With that volume comes an amazing amount of route diversity, including a full spectrum of sport and traditional climbs. I get lost so I can justify doubling my ride time. Unless you live here, the only way to see Fayetteville and the New River is to load your car with every relevant piece of gear you own (seriously, don’t leave anything in the garage) and block off a really, really long weekend, like a five-day weekend. That’s in part how I came to be paddling the River of Death, wondering if I was going to stay inside my tiny rubber boat during the approaching Class III wave train. The rapids on this river sneak up on you, hiding below the horizon line until you’re in the thick of them, bouncing from white cap to white cap. Once you’re in the white water, there’s no time to worry about the 900 things that could go wrong. There’s only time to smile big because before you realize it, you’re out of the rough water and into a calm eddy, ecstatic and wishing you could paddle upriver and do it all over again. Come dinnertime, I’m ravenous as I sit down at Pies & Pints in downtown Fayetteville. It’s not the only place to eat supper, but it feels like it, as a crowd fills the dining room and spills out onto the back patio. They put grapes on their pizza here, which sounds awful until you try it, and then you can’t figure out why you never put grapes on your pizza before. I snag a seat at the bar and talk to the bartender, who has approximately four jobs. A lot of people cobble together multiple gigs so they can call Fayetteville home. Ask him what he does, and he’ll tell you he’s a climber; the jobs are just a means to an end. Early the next morning, the fog is still clinging to the upper edges of the gorge when I make it to Point Lookout. But the sun is starting to peak through in golden stripes like spotlights pointing at the New River Gorge Bridge, a marvelous feat of engineering. The local visitors bureau makes a big deal out of it because it’s one of the longest steel-span bridges in the world, but honestly, there’s no way to appreciate the scope of it all until you see it from below. Drive over the bridge and it just feels like any other elevated road. But hike the Long Point Trail to a sandstone outcropping with arguably the best view in the gorge, and you’ll gawk at the sheer amount of work that must have gone into building the structure. The size of each rusted steel pillar is astonishing. There’s artistry to this arch that goes far beyond its practical purpose of connecting two sides of a gigantic hole. It has a Grand Canyon way of making you contemplate the nature of things. I go from contemplative to giddy later that day as I’m pedaling the Arrowhead Trail System, which connects to Fayetteville’s central Town Park. The Boy Scouts did a bang-up job on this system, carving a series of narrow trails that roll with the contour of the slope. No huge climbs, no huge downhills, just fast, smooth dirt, the kind that makes you feel like a kid. And there are more trails to come: Adam Stephens, owner of Marathon Bikes in Fayetteville, tells me there are plans to build another large loop on the other side of the bridge. Locals call that project the Wildrock Loop, and they hope to complete it through a volunteer effort this summer. When I finish my ride, there’s a dude hanging out at the trailhead. He has three boats on top of his Subaru and a bike on the back. He’s drying his wet suit on the hood of his car, and towels and a bathing suit are draped on the doors. He tells me he might go into town. Or he might do another loop at Arrowhead. Or he might take a nap later. He’s not in a hurry. Fayetteville attracts such people who aren’t in a hurry. It’s inspiring, and I think maybe I could turn my really long weekend into a full week. If you’re looking to camp, check out the new American Alpine Club property, which has elevated platforms and on-site bouldering. Sites start at $5 per person per night for members and $7 for nonmembers.